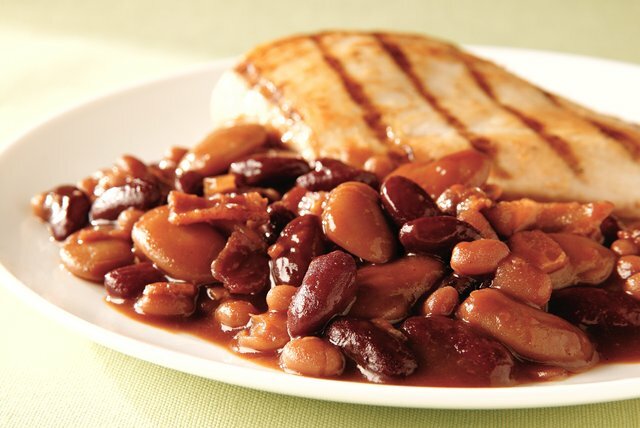 Crumbled bacon and barbecue sauce lend smoky flavor to three types of canned beans in this tasty side-dish casserole. Serve it at your next cookout. Cook bacon in skillet on medium heat until crisp. Remove bacon from skillet; drain on paper towels. Discard all but 2 Tbsp. drippings from skillet. Add onions to reserved drippings; cook and stir on medium heat 3 to 5 min. or until crisp-tender. Spoon into 1-1/2-qt. casserole sprayed with cooking spray. Crumble bacon. Add to onions in casserole along with remaining ingredients; mix well. Cover. This satisfying side can be mixed together ahead of time. Refrigerate up to 24 hours before baking as directed. Prepare using your favorite variety of KRAFT Barbecue Sauce.